BPD Engineering was founded on a very basic business principle, exceed the consumers expectations. Decades of service experience has taught us that satisfied clients are the foundation of a successful business. The litmus test of our success is our customers’ feedback, satisfaction and repeat business. Our mission is to maintain nothing less than 100% client satisfaction with an unmatched customer experience. BPD Engineering’s staff of professionals is trained to assist you with all aspects of your warehousing needs. 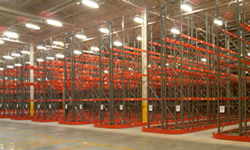 BPD Engineering offers a full range of products for all of your warehousing needs. To keep costs down, your materials are shipped directly from the manufacturing site to your door. BPD Engineering services are available a al carte. However, the greatest benefit of working with us is found with our complete project management services.